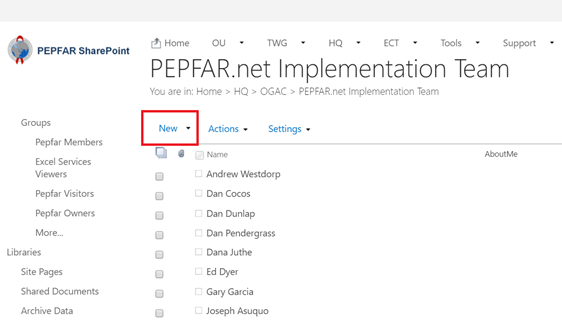 When a team member joins your team or changes roles within your team, you will want to grant them permission to the necessary user group(s) in your PEPFAR SharePoint site. 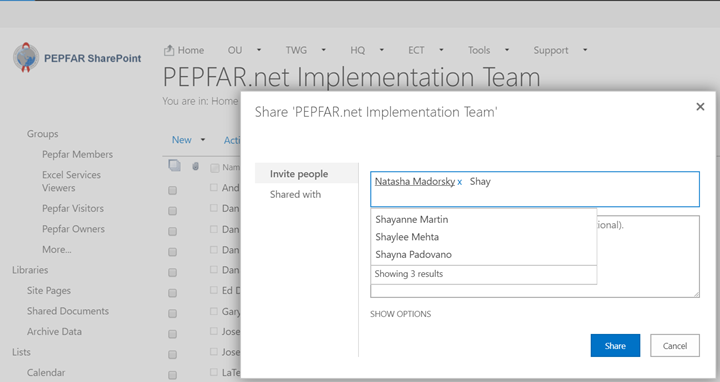 While the PEPFAR SharePoint Team can assist with this task on a limited basis if Powerusers are on extended leave or the membership of the Poweruser group itself is outdated, it is the responsibility of Powerusers to maintain an accurate list of members in the various user groups for your team’s site. 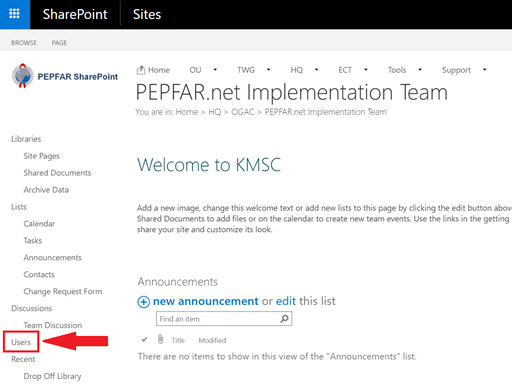 If you are a Poweruser of an OU team site, then your site has a special document library in it called “HQ Collaboration”. This document library is restricted to specific users in the OU and at HQ who need to share content and files with one another for specific business purposes. To view and download this guide as a PDF, scroll to the bottom of the article. On the OU page for which you’d like to edit permissions, navigate to the “Users” tab on the left of your screen. 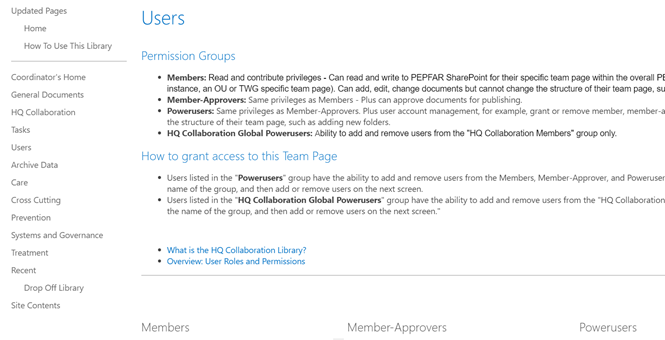 On this page, you will find descriptions of each of the Permission Groups, as well as lists of the page’s Members, Member-Approvers, and Powerusers, as well as HQ Collaboration Members, HQ Collaboration Global Member-Approvers, and HQ Collaboration Global Powerusers. Click the title of the group for which you would like to add or remove users. This will take you to a separate page that lists all members of that permissions group. Select “New,” then “Add Users” from the drop down menu. 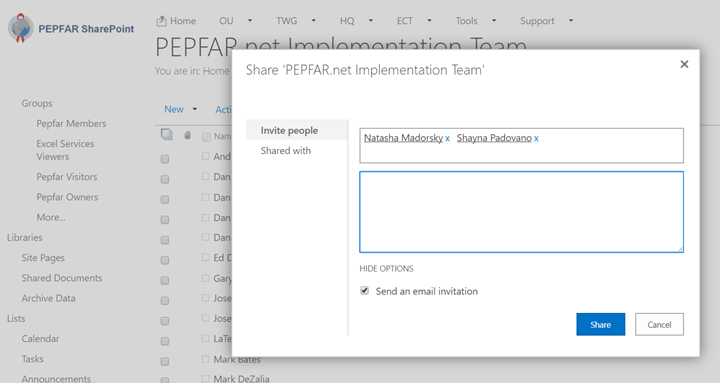 Within the pop-up window, enter the names of the PEPFAR SharePoint users you would like to add to that membership group. As you begin typing a name, PEPFAR SharePoint will search the Active Directory of users and allow you to select the correct user’s name. Select the membership group that you would like to edit.